Hello and Welcome to Day 3 (the final day) of previews for the June release for Sparkle Creations Rubber Stamps! Sparkle is releasing 2 new SCRS images and 1 new Karber clear set, and they are available now! 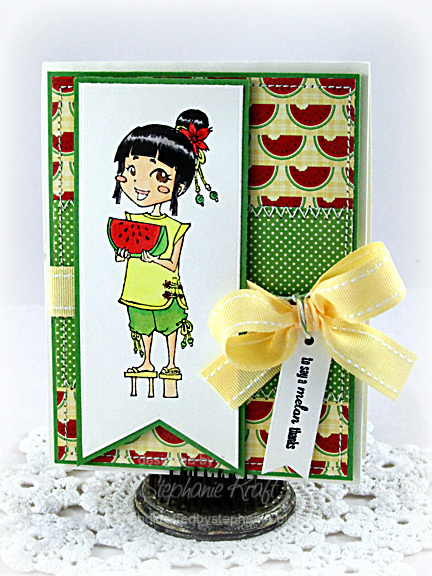 Today we are previewing a new SCRS image, Watermelon Rin and sentiment, "to say a melon thanks"! Doesn't this sweet image of Rin just shout SUMMER?! I stamped and colored her, then I cut her out with the MFT Die-namics Fishtail Banner STAX. I paired her with some paper from the Jillibean Soup Watermelon Gazpacho Soup collection. Be sure to visit all rest of the SCRS designers for more peeks of Watermelon Rin. Sparkle will be giving away a Watermelon Rin to one lucky person! For a chance to win, you need to comment on all of the designer's blogs (list below). Then head on over to the and comment on the Rin post. You have until midnight EST each day to comment. The lucky winner will be announced the following day! Accessories: Die-namics Fishtail Banner STAX, Markers (Copic), Ribbon, Divine Twine, Foam tape, Thread, Sewing machine. BEAUTIFUL! I love the papers and that ribbon--love your coloring! Her hair looks FAB!!!!!!!!!! Hi Stephanie! Your art is just GORGEOUS and I am enjoying browsing your blog. Your work is so pretty to look at. PLEASE consider stopping by Word Art Wednesday to play along in our challenge. We have double prizes this week - two winners. I would SO love having you share your art with us!